October draws to a close and so it’s time to turn to horror and the supernatural, to the weird tale and the things that cannot be known. 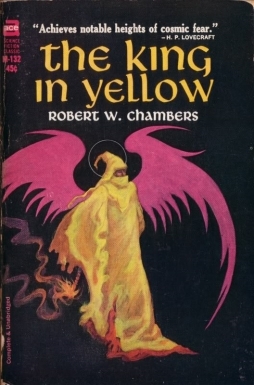 Today, I want to look at one of the founding classics of the weird, Robert W. Chambers’s collection of linked short stories, The King in Yellow. Published in 1895, it was celebrated by H.P. Lovecraft, who used some of the book’s ideas in his Cthulhu mythos; in fact, the book’s inspired a mythos of its own, complete with a wiki site, as well as any amount of further fiction, music, and games. You can find it for yourself online. 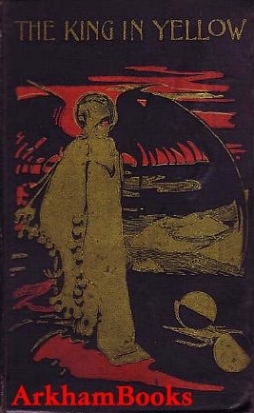 The book’s made up of ten short stories, plus a poem supposedly extracted from a play called The King in Yellow. The first five tales mention the play to varying extents, and all have other fantastic elements, as well as a horrific or weird tone. The sixth story is a set of brief prose poems, while the final four stories are basically mimetic and seem to have nothing to do on a plot level with the first five — though they have certain motifs and themes in common. The play which links the first five stories, the group I’ll call here the ‘mythos stories,’ is said to drive mad anyone who reads it; it’s not clear if it has ever been performed. The first tale’s clearly set in the ‘future’ of 1920, so by extension the following four must be as well (a sculptor mentioned in the first story turns up in the second). The second story features an odd fluid that can turn anything immersed in it to stone. The third and fourth seem to have characters from the play crossing into the real world, while the fifth deals with a timeslip — a blurring of past and present — and also has a character who seems at least tangentially related to the play. But the primary interest in these stories is the play itself, and the strange things it contains. We never get a plot summary, or character list, or even a description of its themes. Only hints and names. Hastur. The Yellow Sign. The Pallid Mask. “Carcosa, where black stars hang in the heavens; where the shadows of men’s thoughts lengthen in the afternoon, when the twin suns sink into the Lake of Hali.” The sinister King in Yellow himself. What does it all add up to? The play seems to somehow exceed the stories in which it’s mentioned. Perhaps because it’s so undefined, it comes to assume monstrous proportions in the imagination of the reader. But then we also see the effects the text has on its own readers: deaths, madness, the loss of the soul. And we see the way the narrators of the stories — all the mythos stories are told in first-person, while all the non-mythos tales are third-person — describe the play. Their language becomes elevated, richer, weirder. And there is that poem that prefaces the book, the song ‘extracted’ from the play, with cloud waves and strange moons. We’re told that the first act of the play is relatively normal, but the second is devastating, undermining sanity. But not how or why. The King in Yellow is fundamentally unknowable. It is an atmosphere built of scattered images and names. It is a flavour of weird unattached to plot or structure. The implied spaces of the nonexistent play spark the reader’s imagination. You can’t help but try to fill in the blanks. Which is dangerous: to do so properly you have to put into the play that you imagine whatever you think is most likely to drive you mad. The mythos stories all seem to me to be concerned with the unknowable: with an individual subjective perception, which may well not be a ‘true’ perception of ‘objective’ reality. The first story, “The Repairer of Reputations,” is narrated by a man we quickly come to recognise as mad. How much of what he tells us, then, can we believe? Is the future world he describes accurate? There is a manuscript he reads, outlining the background of “The Imperial Dynasty of America” and tracing his family history back to things or places in the play: “Carcosa, the Hyades, Hastur, and Aldebaran.” Is it purely fiction? Madness? Or does this imply that the play has some element of truth to it? Paradoxically, because the play’s mentioned by (most of) the narrators of the mythos stories, the play becomes the one certain thing we can know exists beyond the narrators. We can assume some of the narrators have a closer connection to reality than others, but the point is that as the play turns up in their different stories, we see the play as transcending them — as being concrete, objectively provable. The mad vision of art is the thread that establishes reality, that gives meaning. One of the stories I class as a mythos story, though, doesn’t mention the play at all. 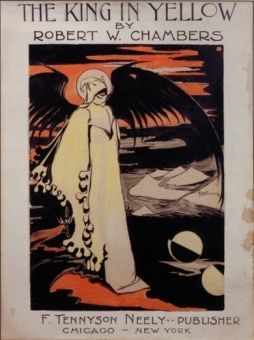 “The Demoiselle D’Ys” has only a tangential connection to the mythos: the narrator, lost in Brittany, meets a woman with two servants, one of whom is named Hastur. That’s a name from the play, but it’s not immediately clear what the significance of the use of the name is. It does seem to connect the story of the play with Brittany, which may be relevant since the non-mythos stories are all set in Paris and many feature Breton characters. So there is some bridge between the mimetic and non-mimetic tales on a plot level. In fact, the stories do feel as though they’re thematically of a piece; many of the mythos tales are set in Paris as well and the descriptions are to some extent of a piece. Subjects echo: love, dramatic and romantic love, figures prominently in many of the tales. So do love triangles and loves ended by death. But so does art: the mimetic tales mostly revolve around American art students, while the mythos stories feature sculptors, musicians, painters, and, of course, the mysterious play. Art is dangerous; it is decadent; it is a highly-wrought and highly-worked struggle with reality. Which is all to say that the book is a meditation on the fin-de-siécle. The demonic art of the mysterious play is, I think, a symbol of the decadent art of the 1890s. The demi-monde of the Paris art students is a reflection of the weird horror of The King in Yellow. The strangeness of the play, of its twin suns and dark stars, is the strangeness of end of the century art. It’s notable that the title character of “The Repairer of Reputations” is named Mister Wilde; of course you can’t help but think of Oscar Wilde. The year Chambers’s book was published was the year Wilde brought his ill-fated lawsuit against the Marquess of Queensberry, which ultimately destroyed his reputation. The mythos and non-mythos tales in the book give two angles on the fin-de-siécle, with the prose poems at the book’s center serving as a kind of hinge: most of the poems open and close with variations on the same words. So while the first mythos story, “The Repairer of Reputations,” is set twenty-five years after the book’s publication date, the second non-mythos story is set twenty-five years before, during the Siege of Paris. On the whole, to me the realist stories are less compelling and less successful than the mythos tales; there’s nothing in them with the obsessive urgency of the play. And the characters are stock parts: cynical art students and fallen women and good-hearted but naïve young Americans. The sense of place is strong and there are wonderful passages of observation, so it is, in a sense, symbolist writing; but it’s attenuated symbolist stuff, without the more-than-rational power of the fantastic imagery in the nonexistent play. I find the book’s stance on the art of its times ambiguous. There is a sense, perhaps, in which it moves from madness to sanity, from the interior of a lunatic’s mind to the rejection of romanticism in everyday life. But it’s the fantastic that makes the stories live; it is what is most decadent that fascinates. What is best here is what is weird. Still, it is perhaps ironic that the book’s known due in part to its connection to Lovecraft. It is to some extent concerned with madness, like Lovecraft, and like Lovecraft concerned with madness that comes from a certain kind of purely intellectual disturbance, a kind of cosmic awakening. But in many ways, it’s an anti-Lovecraftian work. The prose is relatively spare, though also at times lyrical. There is an emphasis on humanity, on the subjectivity of its characters, in a way that seems to me to be quite unlike Lovecraft. Especially, the book’s use of fin-de-siécle romanticism is a distinct contrast to Lovecraft’s pseudo-eighteenth-century conservative humanist irony. You can see the influence Chambers had on Lovecraft, no doubt about it. 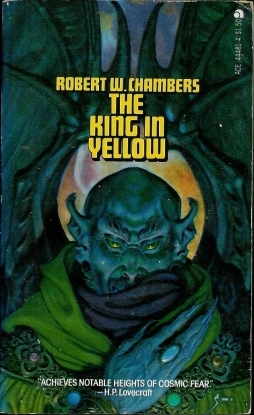 But you can also see how individual The King in Yellow is, how distinct. And if it is less than perfect in its art, it still, appropriately, hints at symmetries and structures that imply more meaning than can be easily grasped.